Many times have I bragged about buying a piece of clothing for N500 or less (here and here), because fashion to me is not how much I buy it but how good it looks on me when I wear it. Buy what fits: When buying an outfit, even with the preliminary assessments of checking things like the feel of the fabric, the durability of the seams, and how well secured the buttons or fasteners are. I still go ahead and fit all items on myself. 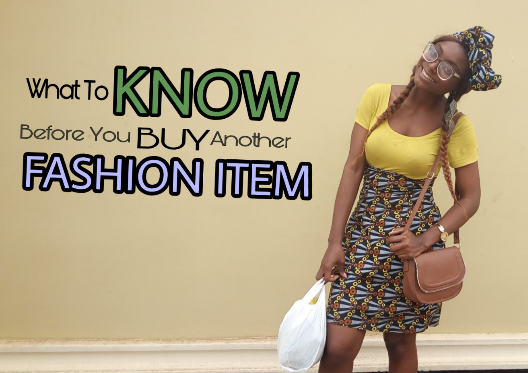 This is because I have learnt from experience that though an outfit may be trendy or even stylish, its fit and quality is what gives it that extra factor. Quality and fit is everything! Really. Related Post: Which is more important - Taste or Style? I certainly cannot afford the highest quality in the world, that kind of quality is very very expensive :) Even at that, I have realized that buying cheap clothing might seem cost-effective in the short term, but in the long term it turns out more expensive when you consider the frequency at which you buy and discard these items. So what are your criteria for deciding on what to shop for (if money is not to be considered)? There are certain wearable items that have been existing in my wardrobe for 3 years and counting now. These are some of the checks I perform to ensure a certain level of quality across the pieces in my wardrobe. Personality: what does it say about me? Recyclable: the possibility of turning it into something new later on? Learn from your buying experience. The person who said experience is the best teacher didn't lie. You can be a fool once, but not twice. Over time, I have learnt to instinctively spot a poor quality outfit when I see one. I also check for things like the look of the buttons/zippers, seams and whether the garment is lined or not. Research shows that when we own something we put a higher value on the item than if we didn’t own it, which is why it can be harder to get rid of items once they are in your wardrobe! Would I ever buy this again? P.s I once bought a blazer I now hate. Well, maybe hate is a strong word. But I still cant believe I bought that thing!?! Can you relate? When it comes to shopping, what is your standard?